Determining Where to Stay in Dubrovnik Shouldn’t Be Difficult! If you are asking yourself “What area of Dubrovnik should I stay in?” you’re definitely not alone. It can be tough to know the differences between great areas like the Old Town versus Ploče or Lapad. Luckily for you, we’ve travelled Croatia for weeks on end and stayed in Dubrovnik! On our blog, we like to write pretty detailed guides (as much as we can). In this one, we want to help you make the best decision when it comes to where to stay in Dubrovnik. We know that people are looking for different features and have different preferences when it comes to Dubrovnik accommodation. You might be looking to stay close to the best Dubrovnik nightlife, while someone else might want to be close to the top attractions and things to do in Dubrovnik! 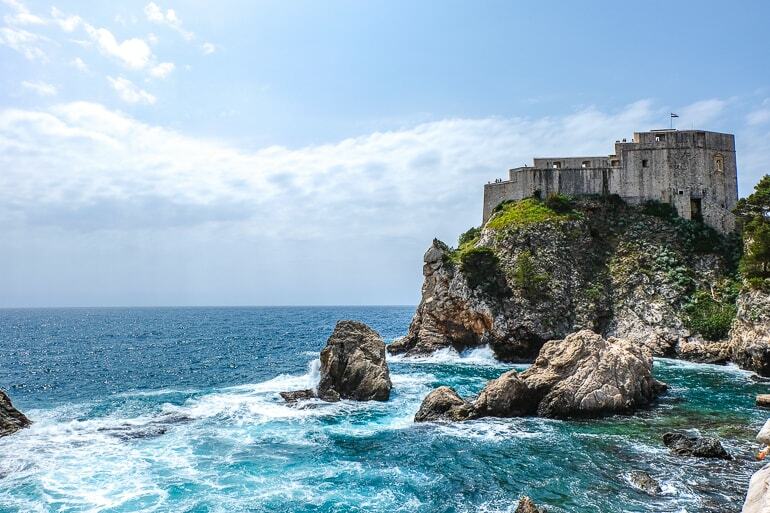 So for this guide, we dive into the top areas around Dubrovnik and then give suggestions for Dubrovnik accommodations – from apartments and Dubrovnik hostels to luxury and boutique hotels. and Other Top Sights all over Croatia! Once you arrive in Dubrovnik and walk around, you will notice that the city isn’t all that big. 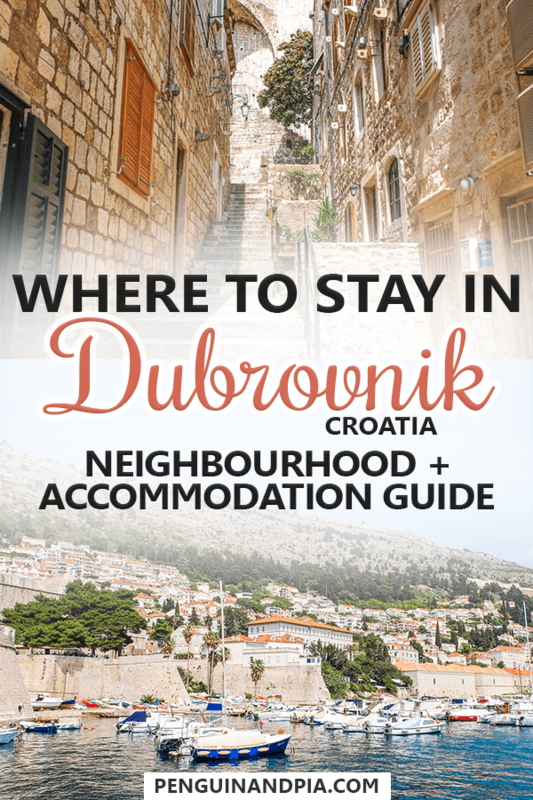 This makes choosing where to stay in Dubrovnik pretty simple as long as you know about the few areas that there are! We stayed in an apartment smack dab in the middle of the city. The place was located on the hill between the foot the Lapad peninsula, Gruž Harbour, the old town, and the main bus station/ferry port. Like, if you Google Map search “Dubrovnik”, we stayed right under where Google places the name “Dubrovnik” on the map. Not even kidding. If you are curious, here is the exact apartment we stayed at in Dubrovnik. We really liked it! This apartment was a 20-minute walk to the Old Town which we actually enjoyed because it gave us exercise and the area wasn’t too busy with people at all. That said, there are plenty of great areas where you can stay – from right on the coast to right in the Old Town if you want. Here is a more detailed breakdown of the few areas for where to stay in Dubrovnik. Also known as Pile, the Old Town of Dubrovnik is a hub of activity and a top place to visit on the list of many Croatia travellers. As a UNESCO World Heritage Site for being one of the best preserved medieval-era fortified cities on the planet, the walled Old Town usually needs little introduction. 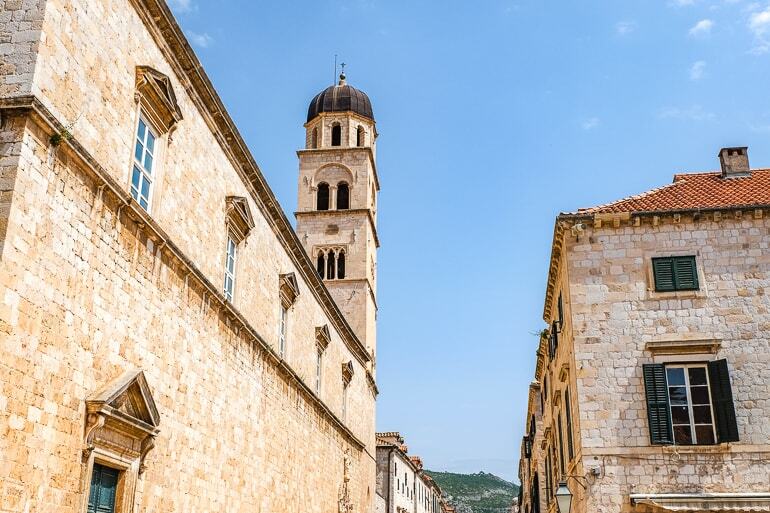 From attractions like churches, monasteries, fountains, museums, walking tours, the city walls themselves, and more – the old town is a very popular place to stay in Dubrovnik. Did we mention it’s a “Game of Thrones” filming location? Show lovers usually know about that fact! Accessed by many gates, the walled Old Town is easy to navigate with the “Stradun” main street cutting through the Old Town lengthwise. Just so you know, the main bus station in the city centre is located at the Pile Gate at the Old Town’s northeast end. If you are coming or going to the Old Town by bus, this is the place to get on and off for basically all bus routes. 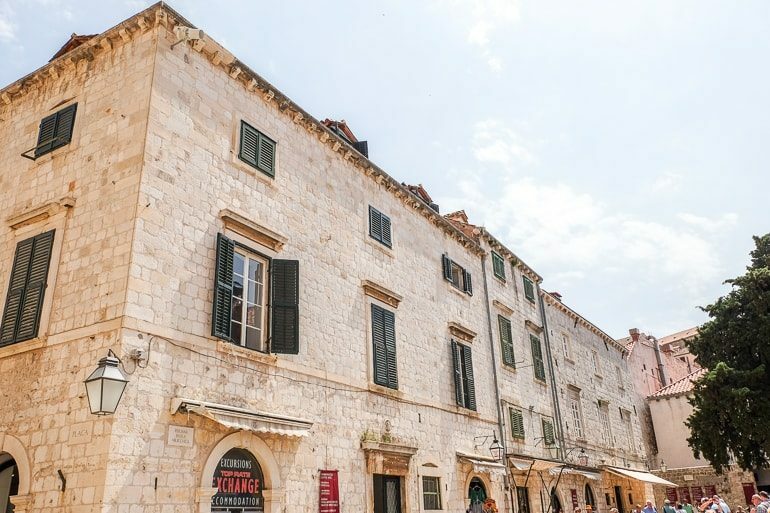 If you are absolutely dead set on staying in the Old Town of Dubrovnik, check out The Pucic Palace – a popular and beautiful hotel located right in the action. There are loads of apartments and hostels in the Old Town listed below if a hotel isn’t for you. If you want something a little more scenic with some trees and shoreline, then the peninsula of Lapad might be more for you. This massive peninsula makes up a pretty large portion of the entire city of Dubrovnik. Located to the northwest of the Old Town, the area is prime for hiking and exploring the coast – connected to the mainland only by the base of Gruž Harbour. One of the highlights of the peninsula is an area/neighbourhood called Babib Kuk. This area is known for being a little newer and wealthier than the rest of the city. As such, you’ll find a number of high-end resort hotels, spas, and restaurants here. There are also a number of beaches, like Copacabana Beach, which draw crowds in during the summer months. As a general overview of the area, the peninsula is far from the Old Town but has its own vibe. It’s also connected by bus, taxi, and/or private shuttle to the Old Town. If you want a bit of quiet away from the Old Town and are seeking a resort-style hotel, then you should book a stay at The Hotel Dubrovnik Palace. Located on the water and facing out into the open sea with a massive green park behind, there are multiple pools, amazing views, and much more. If you wanted to stay right on the water close to Babin Kuk but still very much looking inland close to Gruž Harbour, then check out Hotel Kazbek – a upscale hotel in a 16th century villa! The accommodations along Ploče are basically perfect – there’s the Hotel Excelsior at the far right side! Located to the south of the Old Town on the opposite side as Lapad Peninsula, Ploče is an area along the waterfront known for upscale accommodation and apartments that sit high up on the hill. These places face the Adriatic Sea toward Lokrum Island. This southern strip of the city connects to the Old Town via the Ploče Gate. Besides the stunning seaside views, the area is known for Banje Beach, one of the most popular beaches in the city. If you want to stay in Ploče, there is no shortage of great hotels and apartments. 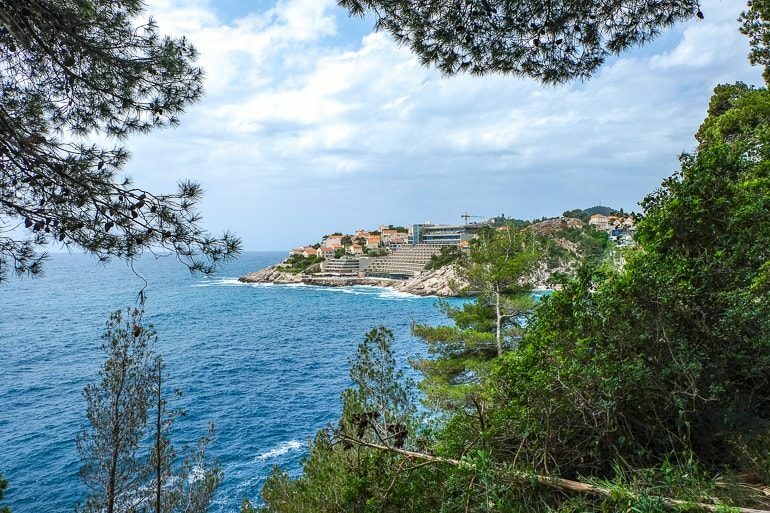 Check out the Grand Villa Argentina for an affordable 5-star stay on the water or the Villa Orsula Dubrovnik for an upscale Croatia experience in an old villa. If you aren’t convinced, a stay at the Hotel Excelsior with stunning views, service, and food might be for you. If you want to change it up from the above locations, you can stay on the water in the area of Gruž. We’ve talked about Gruž Harbour a lot – well, now you can choose to stay here except on the other side from Lapad Peninsula touching the mainland. Gruž is basically at the foot of the limestone mountains. The area is especially important because it’s where you find the main ferry terminal/port and main bus station. Basically, it’s a busy place! That said, once you get away from the station area, there are waterfront hotels all along the boardwalk that stretches toward the foot of the bay in the direction of the Old Town. The area actually has a few nice shops and an open-air farmers market. You also get to see the many boats in the water and have access to boat excursions. We really liked the walk along the marina area. You could choose to stay here and/or you could stay here if you had an early bus/ferry to catch and were paranoid you might miss it! Check out the Berkeley Hotel & Spa for a nice stay since it’s right across from the water and well-reviewed! Now that we have walked through a few of the main areas in Dubrovnik, we’re going to divide the post into Dubrovnik accommodation types. We’ll also offer up a few recommended places for you to look at! This way, if you know you want a certain style of accommodation, you can find and book what you are looking for. Remember, stay open-minded about the areas these hotels, apartments, hostels, and bed and breakfasts are located in if it is not the Old Town. These areas are ALL well connected by the Dubrovnik bus system so you can get to and from the main areas easily. The traffic DOES get busy closer to the old town in which case we recommend to just get off the bus and walk the rest of the way for like 5 minutes. The area is lovely! This could honestly be the door to your apartment in Dubrovnik’s famous Old Town. As you travel around Croatia (and the Balkans for that matter) you will find that apartment rentals are very common. The same can be said for Dubrovnik. 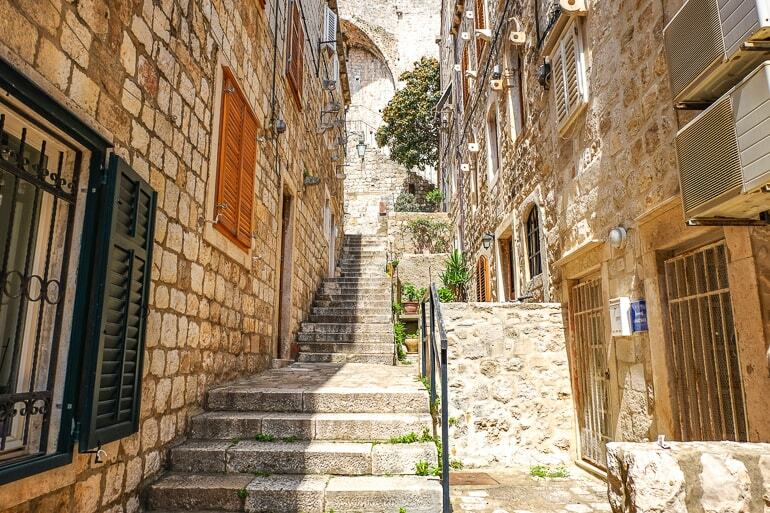 There are SO many apartment rentals in Dubrovnik to choose from. Apartments, also sometimes spelled “apartmani”, are a great way to have a space of your own if you are staying for a few days. When we stayed in Dubrovnik, this is what we did. Here is the exact apartment we stayed at in Dubrovnik. The host was easy to contact and coordinate with, and it was nice to stay outside of the Old Town to get in a walk each day. We also like having a kitchen to prepare breakfast in the morning before we explore. Having a “self-contained” apartment isn’t for everyone but some even come with pools, if you are lucky! 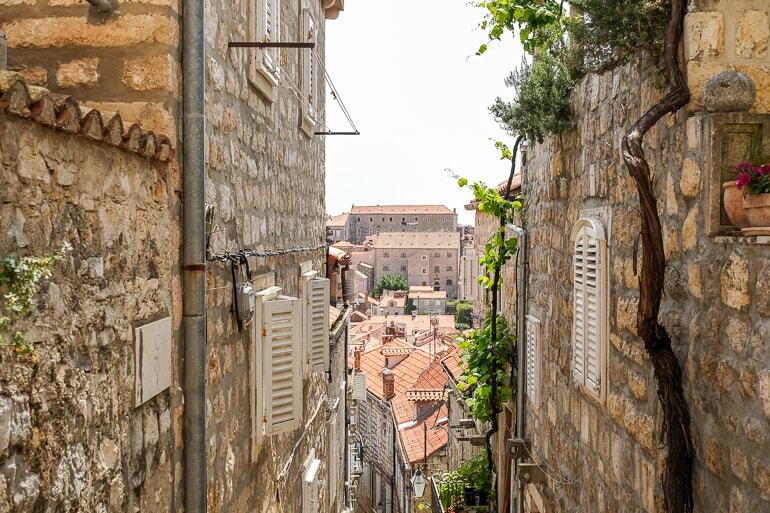 If an apartment is what you seek, check here to find the best apartments in Dubrovnik – many of which are located right in the Old Town and very affordable! Starting off strong, the Art House is located in one of the most central locations in the city. Overlooking Stradun and the Orlando Column in the square, these apartments are cozy and clean with everything you’d need. The host even goes the extra mile to make sure you have everything you need. If you are looking for an apartment to that is located outside the Old Town, this one is for you. These warmly decorated apartments are in the perfect location between top attractions while not being in the heart of the city walls. You get the best of all worlds – a seaside terrace with sea views and a nice walk from Lapad to the Old Town. Bellevue Beach is even close by for you to use! If you are looking for cheap hotels in Dubrovnik, you will certainly have many to choose from. Before we dive in, it’s important to recognize that the prices for Dubrovnik are sometimes a little confusing. Generally, you can get really nice hotels for cheaper prices. This is partially because there are just SO many places that you can book – it’s driven the price down a bit (which is good for consumers). That said, the “cheaper” hotels might be found a bit further from the Old Town. However, as we mentioned above, there are really no bad places to stay in Dubrovnik. For example, some hotels might be higher up on the mountain close to the highway. These places have pools and unreal views of the sea and city below so it’s not like you are loosing out completely! You can check here for cheap hotels in Dubrovnik. Offering more of a guesthouse feel, this authentically Croatian hotel makes you feel like you are staying in a charming villa “back in time”. The exposed stone and wood mix with clean furnishings make for a pleasant stay. The location is great seeing as Villa Sigurata is right in the Old Town – and the price isn’t that steep, surprisingly! If you choose the Rixos Libertas, you get to stay there! Despite being a 5-star resort style hotel, it’s actually an affordable hotel. The Rixos Libertas has plenty of rooms with seaside views, a great breakfast, and it even has a beach nearby (Bellevue Beach). This is something which many places can’t necessarily say about their properties/locations! 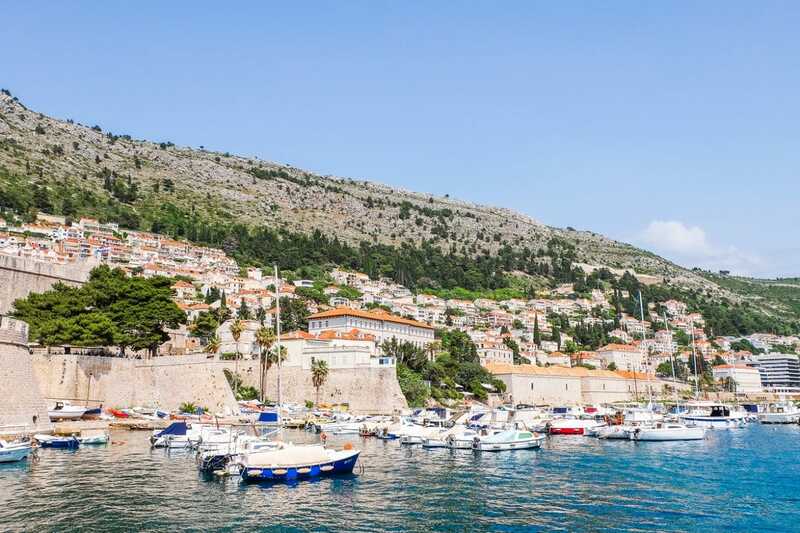 Finding a boutique hotel in Dubrovnik won’t be an issue, either. There are plenty of beautiful, elegant, and/or modern places that are perfect for that Dubrovnik getaway. Since the price is generally a bit higher, you pay for great service and amazing locations. As such, you will find boutique hotels in the heart of the Old Town OR along the waterfront in Ploče. If you are looking for a boutique hotel experience, check here to search the best Boutique Hotels in Dubrovnik. The upper terrace of Boutique Hotel gets this beautiful tower and rooftops as the view! When we go back to Dubrovnik, this place is basically out bucket list location. Located just steps from the Pile Gate, the Boutique Hotel Old Town has an upper rooftop terrace that overlooks the entire city. It’s the dining area/area for drinks and it looks absolutely gorgeous up there. Just imagine a glass of wine in the evening as the city falls asleep… awesome. A stay in Hotel Lapad, on the other hand, is a totally different feel. Hotel Lapad is located on the Lapad peninsula right on the water. Facing out over the Gruž Marina, the hotel is in an old building with a beautiful front facade. There is an outdoor pool and a great onsite restaurant that has a great selection for breakfast. You can still get to the Old Town by car or bus very easily! Dubrovnik wouldn’t be Dubrovnik without a variety of luxury 5-star hotels. From the heart of the Old Town to the shores with amazing sunsets and sea views, these luxury hotels are where you go to absolutely pamper yourself for a few days. These places generally have pools, spas, and other facilities like tennis courts, amazing onsite restaurants, and more. If this is for you, check here to search the best luxury hotels in Dubrovnik. The Hilton is steps away from Fort Lovrijenac! If you want a name you know and trust, then you can stay at the Hilton Imperial Dubrovnik. Located right across from the Pile Gate into the Old Town, the hotel complex is stunning and bold from the outside. You cannot miss it! You get all the amenities of a 5-star hotel just steps from the city gates! Another five-star hotel you might consider is Hotel More. Located on the Lapad Peninsula right on the coast facing the open sea, this is a very different location than close to/in the Old Town! While it has the amenities of a resort-style hotel, it’s not as large as some of the other hotels. You get to enjoy an outdoor pool, a charming dining area, and a unique “Cave Bar” – a place for drinks in a small cave! If you are looking for a classic Bed and Breakfast in Dubrovnik, you will have to search a bit. Luckily, we have two of them right here! This is because there aren’t as many Bed and Breakfasts in Dubrovnik as you might be used to. Instead, there are lots of self-catered apartments in Dubrovnik and SOME of them MIGHT offer breakfast if the host is around. As for true “B&B” with the cute room and breakfast included, both of these highly-rated ones are located in two different parts of the city. There are positives with both of them. You basically choose between the Old Town or sea views with a swimming pool! Andio B&B is situated in a building close by that looks almost identical to this – gorgeous! We love the vibe of Andio. It’s located right in the Old Town just steps from the main pedestrian walkway, but it’s still quiet since it’s located on a side-street. All the rooms are decorated differently which is fun – and it’s actually an affordable option given the location and breakfast. One of the only other true “Bed and Breakfasts” is Villa Klaic. Located up on the mountain closer to where the highway runs through the top of the city, you’ll be treated to amazing views of the city and sea below. The rooms are rustic but clean and modern. This place even has an outdoor pool, great patio, and free beer! The host is supposed to be super kind – not even kidding! Both entrances to the hostels below are located in alleys close by with views like this! Hostels are a great choice if you are looking for a place to stay in Dubrovnik. We always like to remind people that hostels are NOT just for “classic backpackers” anymore. There are still dorm-style rooms but many hostels have amazing private rooms in boutique styles. Yeah, there are still gross and dirty hostels out here – but many of the hostels these days are clean, safe, and easily nicer than some low-level hotels. That said, most of the Dubrovnik hostels are located in the Old Town while the rest of the hostels are very close by. You get a bed in a great location no matter where you book, basically. Hostels in Dubrovnik are also a great option since the staff are a wealth of knowledge to “do Dubrovnik right” and can help with booking tours, excursions, finding where to eat, etc. If you need a hostel for your stay, check here for hostels in Dubrovnik! Below are two of the featured/most popular hostels in the city. Hostel Angelina is a cozy and clean hostel located near the Pile Gate. Just up a few steps up from Stradun and you are there. The hostel has an upper terrace that overlooks the city rooftops and a knowledgeable staff that can help you make the most of your stay. Lockers are provided but you have to bring your own lock. Check out Hostel Angelina for the authentic Croatian building and experience! If you are looking for one of the most popular hostels in the city, Old Town Hostel is probably it! Also located just a few steps up the hill from the Pile Gate off of Stradun, the hostel has a cozy common area and large rooms that are clean and bright! As a boutique hostel, the size is pretty small so you can really get to know your other travellers. 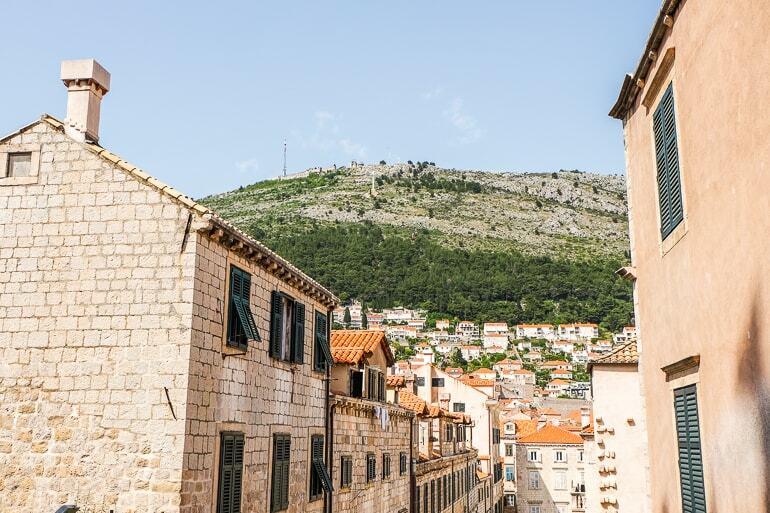 And there you have it – a rundown of where to stay in Dubrovnik, Croatia! In the end, there are so many places to choose from. Just know your budget, know your interests, and know your dates (pretty important) and you will be good to book something that is right for you! We hope you have an awesome time in the city. Just please remember to be a responsible tourist and appreciate the place for its beauty, people, and stunning views. Don’t forget to take in the seaside air. It helps clear your head.